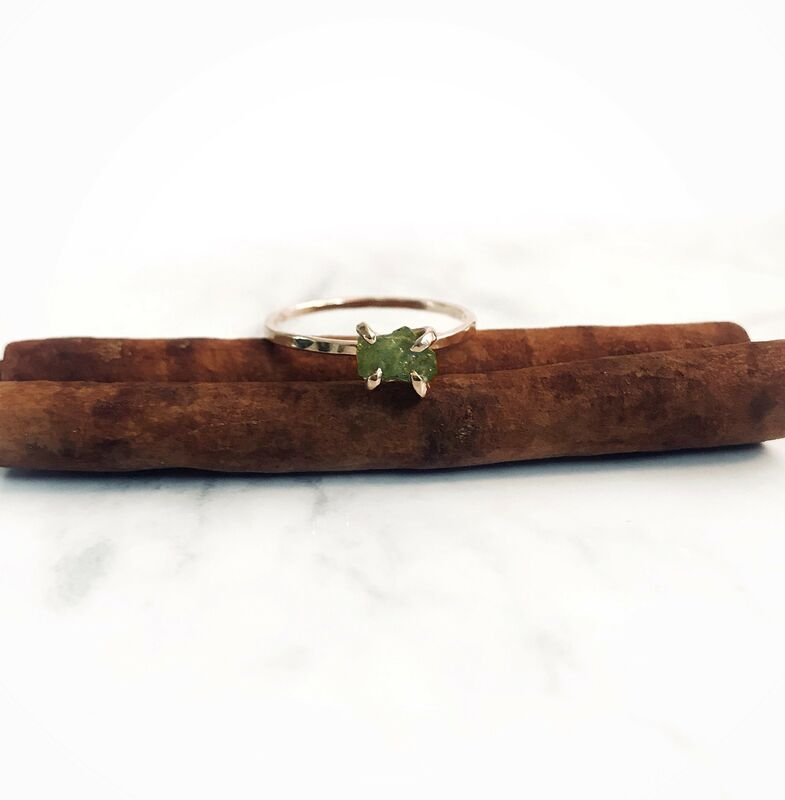 Delicate Peridot Ring with raw stone is the focus on this handmade 14K yellow gold filled ring is a dainty ring. The raw stone handmade cut is unique ring, exactly the way it was created by nature. This raw gems is set in a 14/20 gold filled handmade claw setting to reveal the maximum amount of this unique stone. ~️ material: 14K gold filled band on this ring has been textured to compliment the rustic look. The Peridot crystal stone is a gem at inspiring the seekers of the universe. If it’s light and love that you're after, keep this cheerful and uplifting stone in your environment and give your Feng Shui a boost with its candy-colored hue and protective, powerful qualities. The Peridot is considered a wood element and works to promote abundance, prosperity, and happiness in your home. It also addsa pop of color to your interior design scheme, making Peridot an interior decorator’s dream. After giving it an intention, place a polished stone or statue in the southeast or east corner of your home and get ready for its powerful vibes to bring wealth and well-being into your life.